Combine blood orange and ruby red grapefruit sections and flavor with fresh ginger, vanilla, and cardamom for a holiday side dish or simple fruit dessert. 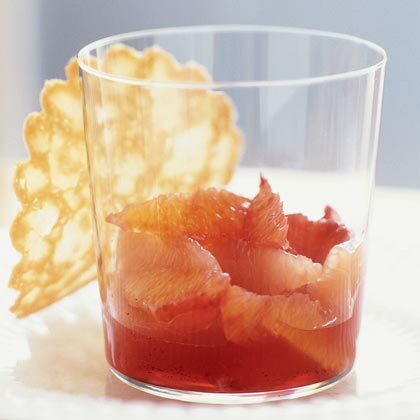 The splash of grenadine adds an even deeper rubycolor to the dish. In a 1 1/2- to 2-quart pan over medium-low heat, stir sugar, grenadine, ginger, cardamom pods, vanilla bean, and 3/4 cup water until sugar is dissolved. Simmer, stirring occasionally, for 15 minutes. Remove from heat; let stand 30 minutes. Meanwhile, using a sharp knife, cut off and discard ends from oranges and grapefruit. Carefully slice off peel and outer membrane, following the curve of the fruit. With your fingers or the knife, gently pry sections of fruit from inner membranes and place in a shallow bowl; discard membranes. Pour syrup through a fine strainer into bowl with citrus segments; discard spices. Cover and chill for at least 1 hour or up to 1 day. Spoon fruit and syrup into compote glasses.